Heat griddle or large nonstick skillet over medium-high heat (about 375°F). Grease with vegetable oil or butter. In large bowl, stir pancake mix, milk and egg with whisk or fork until smooth. Drop batter in tablespoons onto hot greased skillet. Cook 1 to 2 minutes until bubbles begin to form on surface and edges are dry. Turn; cook about 1 minute more or until golden brown. Transfer to plate. Repeat with remaining batter. 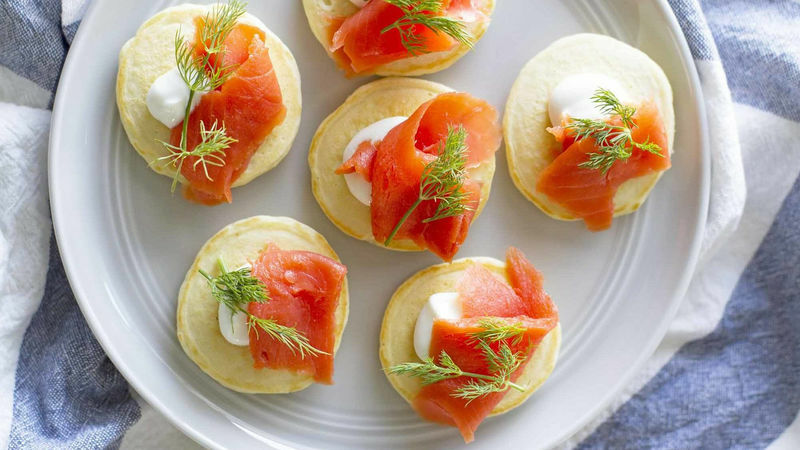 To serve, top each pancake with a dollop of creme fraiche, a small, thin slice of smoked salmon and a sprig of dill.